What started as a popular Greek food truck has since morphed into two brick-and-mortar locations, one in Hollywood and one in Los Feliz. 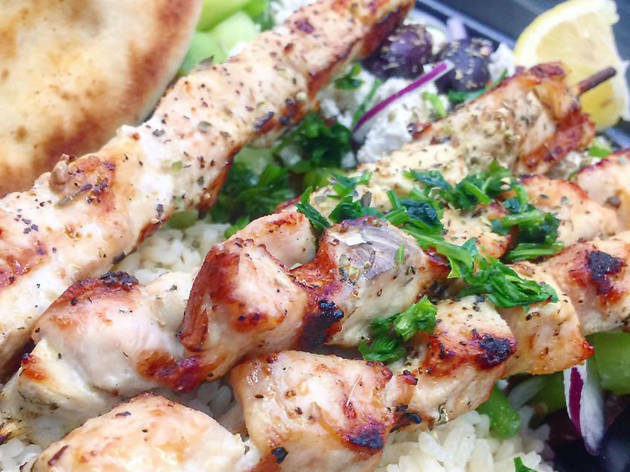 Good Greek Grill has transfered the success of its truck into casual restaurants where you can order thick gyros, salads, platters and their beloved Zeus fries: Greek fries topped with tzatziki sauce, feta cheese, a choice of protein, red onion, tomato, parsley and herbs. Finish with some baklava bites before scheduling your next visit. Amazing food! The best place to get authentic Greek food in la hands down. Their pork on the spit is to die for along with the baklava bites and their Greek coffee. G3 is a true gem! 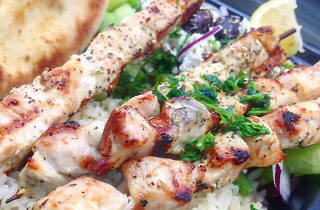 Mmmmmmmm--tasty and great for a takeout, this Greek truck turned brick and mortar is a great neighborhood spot. Whether you go with loaded Zeus fries or a giant gyro, you will find yourself stuffed. Spanakopita and saganaki bites are unbelievably delicious. Service is prompt and friendly, it's perfect for dinner before a show at the Los Feliz 3 or Skylight Theatre or if you just need something homey and filling to take home.